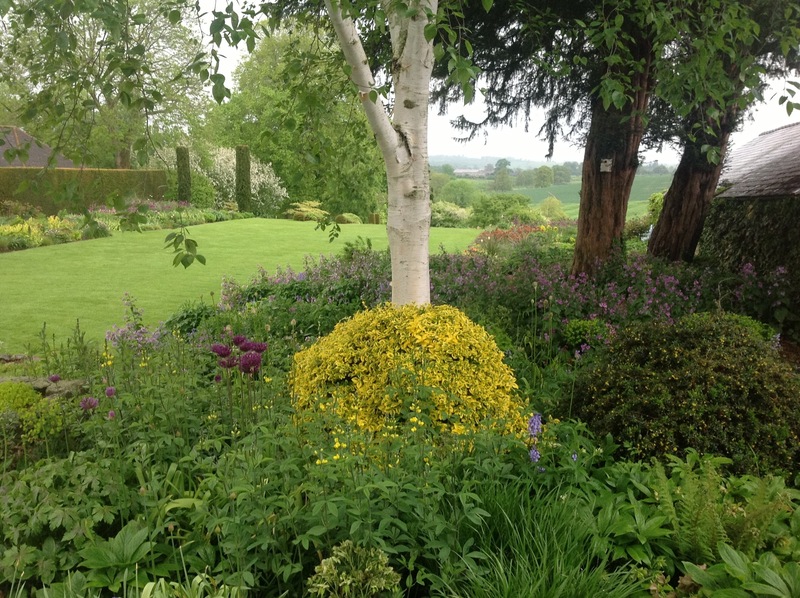 A photograph taken yesterday of the swathe of honesty under the yew trees with Betula jacquemontii in the foreground. When in Corfu in April, you see hillsides stretching away into the distance covered in a lilac haze. This is Lunaria annua. We have it here, shimmering under the yew trees, where it survives in bone dry soil and glade-like shade and occasional sun. It is very obliging, self seeding around in profusion and needing no intervention other than pulling out any that appear in the gravel path or in amongst plants that would be overwhelmed by it. We have two colours; the lilac and a strong magenta. The two are kept ruthlessly apart, segregated by the main lawn over which they eye each other up, preening in an attempt to make you chose which is the fairest. To keep the colours pure we can’t mulch the beds with our own compost as the seeds would get mixed up as we cut down the old stalks in late winter. Our visitors often see things we overlook. An American couple last year were amazed that we grew it because, frankly, in a couple of months time, it will look ghastly, if only briefly. After the flowers have fallen, the seed heads form. These start as green discs before turning a mucky sand colour. But then . . . their second season of beauty begins as the discs turn white and then as the outer sheath drops away the transparent inner disc appears that shines through winter and gives the plant one of its names – moonflower. It’s also known more commonly as honesty. Very appropriate really, as this is a family of barristers, solicitors and generally upstanding people!